Do you love to bring your pooch along on your adventures? Dogs are welcome on 75% of Methow Trails during the summer, all National Forest trails and in Wilderness Areas. Dogs, however, are not permitted on trails in North Cascades National Park or on Sun Mtn. Lodge property. Please remember that trails are multi-use, and it is important to respect other trail users and private land. 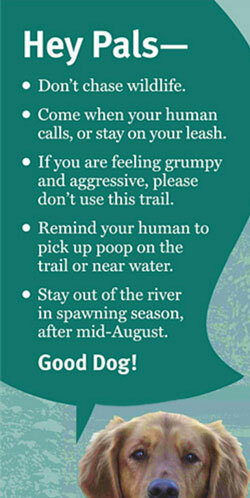 See below for more guidelines for dogs on multi-use trails. To locate lodging and vacation rentals that allow dogs, visit the Winthrop, Washington, website pet-friendly lodging page.